His acceptance speech tonight was good, but the best speech of the convention was John Kerry's. See here for more discussion. As a mathematical discipline travels far from its empirical source... it is beset with very grave dangers. It becomes more and more purely aestheticizing, more and more purely l'art pour l'art. ...In other words, at a great distance from its empirical source, or after much "abstract" inbreeding, a mathematical subject is in danger of degeneration. From the opening material of the book John von Neumann and Modern Economics. I highly recommend the chapter by Paul Samuelson. I'm off soon to the following meeting at ECT: European Center for Theoretical Studies in Nuclear Physics, which is located in the mountain town of Trento, in the Italian Alps. The picture above was taken just north of Trento. I'm excited to see the dolomiti! program , poster , slides of my talk. Dense nuclear matter: intuition fails! is the generic situation. Note Z > 0 so F+ > F- is not possible, but they can be exactly equal: F+ = F- , which is where the sign problem is most severe (see below). Since the F's are analytic except at phase boundaries, we reasoned that if they are equal in a region they must be equal everywhere within that phase region. At mu = 0 we know Z- = 0, so we assumed that there would be a region of small mu where F+ < F- and that this region would extend into the mu-T plane. It is quite strange to me that zero density QCD can only be reached in this way. The case we are most familiar with turns out to be the oddball. To make a long story short, our conjecture is probably incorrect: what we thought would be "exceptional" regions in the phase diagram are the typical ones, and vice versa -- at least as far as anyone knows. Note to experts: we used the term "sign problem" a bit differently than apparently it is used in the lattice community. We refer to dense QCD as having a sign problem even though we don't know for sure (i.e., for all mu and T) that Z is exponentially small in V due to cancellations (i.e., a "severe sign problem"). Our usage probably translates to "potential sign problem" -- the functional measure isn't positive, so potentially such cancellations can occur, although we do not know if in fact they do. We got a lot of emails from people who thought we were claiming to have a method for dealing with severe sign problems, but in fact we were claiming something else entirely: that there should be regions in the phase diagram where the sign problem is not severe. New paper! Probably too technical to go into here, but it relates to our current inability to directly simulate dense nuclear matter (QCD at nonzero baryon density). When the number of quarks and antiquarks is equal, the functional integral representation of the partition function Z has good positivity properties and can be evaluated using importance sampling (lattice Monte Carlo methods). That is no longer true when the system has nonzero baryon number, as would be the case inside a neutron star or in nuclear matter. We rewrite Z = Z+ - Z- , where Z+ and Z- have good positivity properties, and conjecture, based on arguments using the analytic properties of the free energy, that at most points of the phase diagram Z+ dominates Z-. At such points one can simulate the theory using Monte Carlo. We investigate the Euclidean path integral formulation of QCD at finite baryon density. We show that the partition function Z can be written as the difference between two sums, each of which defines a partition function with positive weights. We argue that at most points on the phase diagram one will give an exponentially larger contribution than the other. At such points Z can be replaced by a more tractable path integral with positive definite measure, allowing for lattice simulation as well as the application of QCD inequalities. We also propose a test to control the accuracy of approximation in actual Monte Carlo simulations. 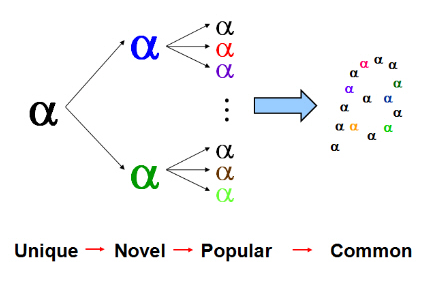 Our analysis may be applicable to other systems with a sign problem, such as chiral gauge theory. What did all those medals cost China? Billions of dollars and the effort and sacrifice of countless young athletes, most of whom came nowhere near the Olympics, let alone a medal. There are an estimated 400k kids in specialized sports schools in China. WSJ: ...In the eight years to 2006, the latest set of full-year figures available, China's spending on sports increased 149% to 9.2 billion yuan ($1.35 billion at today's exchange rates), compared with a 36% increase to 7.1 billion yuan in natural-disaster relief. Adding to the budgetary pressure is the need to rebuild after this year's Sichuan earthquake, which will be financed by a 5% reduction in all other government spending. On top of all that, China's Olympic building spree has left the government with 31 new and refurbished stadiums that it now must maintain. ...Because of China's population-control policies that allow most families only one child, they are increasingly reluctant to turn over their offspring to the state sports academies. Much of China's athletic success has been built on vast numbers of athletes from peasant stock who were willing to chi ku -- to "eat bitterness" -- to grind through the state sports system and have a shot at success. 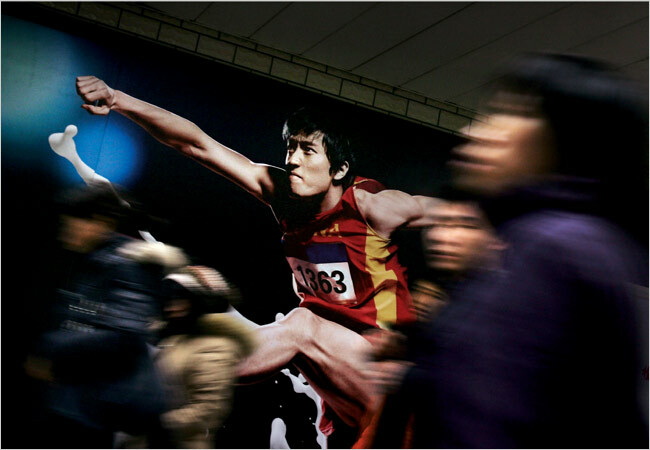 Despite such heavy spending, China didn't make up very much ground in track and field. Liu Xiang's 110m hurdles gold in Athens was described as "the heaviest" and "the one with the most gold content" of all of China's medals. (Note, cf. Phelps, that they didn't say this about a swimming medal. They have a pretty realistic idea of which sports are the most competitive :-) Liu's failure to compete in Beijing due to injury may have been the single biggest Olympics story in the Chinese media. On the other hand, Jamaica (population less than 3 million) had a great Olympics on the track: three golds and three world records for superman Bolt, and a medal sweep of the women's 100m. 19.30 in the 200m, breaking Michael Johnson's record! Two world records, two gold medals. He led by 10m at the finish, and this time there was no show boating. I remember watching Johnson set the record in Atlanta (on television). I couldn't imagine when -- if ever -- it would be broken. In the semifinal heat yesterday Bolt looked like he was jogging at the finish, yet placed ahead of Shawn Crawford, the defending gold medalist from Athens who finished third in the final. Bolt destroyed his competition effortlessly. He is a superman among boys. Hopefully the silly US media will forget about Phelps and focus on the real story in Beijing. Note added: Bolt donated $50k to earthquake relief in Sichuan province. He said he was moved to tears on the night of winning the 200m race, when more than 90,000 spectators in the Bird's Nest sang "happy birthday" for him. Unfortunately, not of interest to NBC. NYTimes: The margin of victory seemed almost impossible. His finishing time, a sport-shattering moment. Just days after Usain Bolt electrified track and field with a world-record run for the ages in the 100 meters, he might have outdone himself in the 200. Jamaica’s wunderkind surged so far ahead of a stellar Olympic final field Wednesday night that the final 50 meters inspired sheer awe. Running hard through the finish, Bolt not only ran 19.30, breaking the world record by two-hundredths of a second less than two hours before his 22nd birthday, but he seemed to set new parameters on what humans can achieve. This time, unlike in the 100 meters, Bolt ran hard the entire race, clearly wanting to show what he can do when he is serious. In the 100, he essentially stopped racing with about 10 meters to go, threw out his arms and slapped his chest before he crossed the finish line. That made his time of 9.69 — .03 better than the world record — that much more astounding because it could have been even lower. In the 200, Bolt overpowered the field in the turn, entering the straighaway with the only question left being how much would he win by and would he break the world record. That was 19.32 seconds, set by the American Michael Johnson at the 1996 Atlanta Games. Before Wednesday night, Johnson’s record run was the only performance under 19.62. 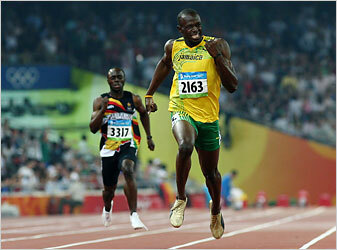 Bolt’s previous personal best was 19.67. ...Usain Bolt has made this a two-athlete Olympics. In two bursts of speed, he has matched much of the buzz for Michael Phelps, who won eight medals in the pool. 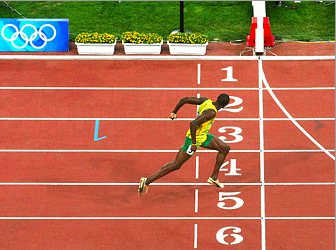 Bolt’s two gold medals were won out in the open, on two feet. The first one was play. The second was work. But both are records. Kiss the old ones goodbye. 9.69 -- and he strolled across the finish line while beating his chest with no one even close! Bolt is 6 foot 5 and only 21 years old. I think Michael Johnson's record in the 200m is in jeopardy. Bolt is probably the greatest of all time, assuming he's clean. NBC: ...With a full seven strides to go, he dropped his arms and let them fall outstretched to his sides, appearing almost to run sideways as he played to the sold-out crowd of 91,000 at the Bird's Nest. Just before the finish line, he started high-stepping and, for good measure, executed a chest-thump. All that, and still -- 9.69 seconds. 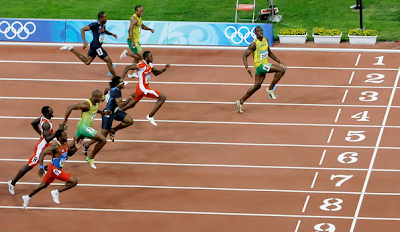 Bolt simply ran away from the rest of the best of the world. "I was just saying I'm No. 1," Bolt said later. "This is what I came out here to do, and I made it." 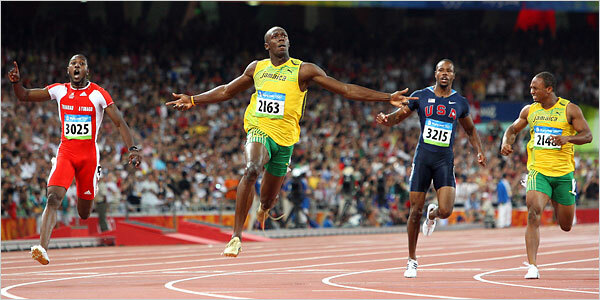 BBC: ...Michael Johnson described [it] as "the greatest 100m performance in the history of the event". I was a competitive swimmer from age 7 through college. My high school team won a state title my junior year and conference titles all four years I was on the team. We had numerous All-Americans and state champions. I'm still ranked (barely) on the all-time list. But the best athlete I ever competed against was a running back who had been an LA sprint champion and had turned down Division I football scholarships to attend Caltech (he was 6 foot 2 and around 190-200). I could not lay a hand on him in the open field and he was incredibly strong in the weight room even though he never trained. (Most swimmers are shockingly weak when it comes to lifts.) During our senior year scouts from USFL teams were still looking him over as a free safety, despite his not having played high level ball in college. There is no comparison between the quality of athlete in amateur, fringe Olympic sports and the big money sports like football and basketball. 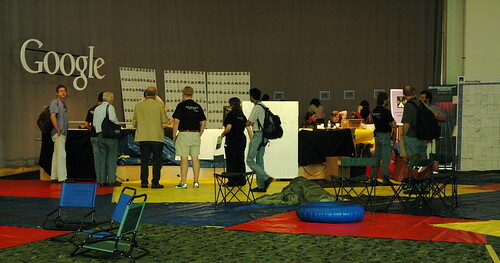 Scifoo 2008 was tremendous fun. Thanks to all the organizers from Google, Nature and O'Reilly who made it happen. I guess I'm used to meetings with enormous concentrations of brainpower, but usually the attendees share similar backgrounds. At Scifoo the diversity of knowledge is overwhelming. I didn't take very many photos because I was too busy trying to absorb every bit of information I could during the conference. Here's a shot of the crowd at the last session, which consisted of 2 minute recaps of some popular talks. Coincidentally, there are a number of physicists in the foreground: Wally Gilbert (a student of Abdus Salam who later won the Nobel prize for work in molecular biology and co-founded Biogen. He was a Senior Fellow when I was at Harvard), Sabine Hossenfelder (Perimeter Institute and blogger) and Paul Davies (relativist and author, looking down into his bag). 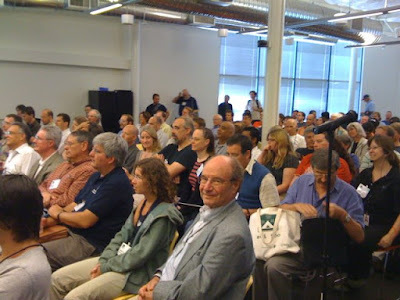 In this shot you can see Sara Winge, Tim O'Reilly, Chris DiBona and Timo Hannay at the front of the room. 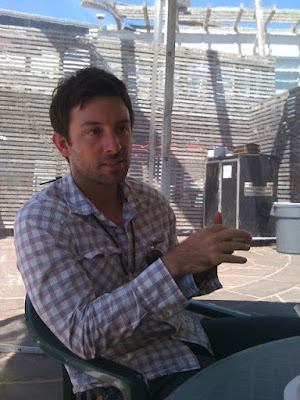 This one was taken by Esther Dyson. In the foreground are George Dyson, Stewart Brand, Danny Hillis and Neal Stephenson (who attended my high school and shares my interest in jiujitsu :-) George Dyson gave an amazing talk on the history of the Monte Carlo method, focusing on a newly discovered set of telegrams between von Neumann and his wife which spanned the development of the atomic bomb and the first electronic computers. I've always been astonished that no one has written a great biography of von Neumann, but George may be taking on that task. 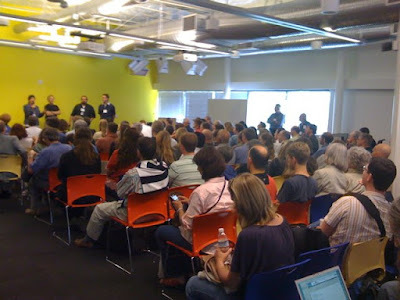 I'm off to the Googleplex tomorrow for Scifoo 2008, sponsored by Google, Nature and O'Reilly. With all the interesting people and talks (and Olympics going on in the background! ), I doubt I will post very much for the next few days! William Bernstein at Efficient Frontier noted back in March that dysfunctional credit markets are exhibiting historically anomalous yield spreads. Aversion to credit risk is at almost irrational levels. Spreads are only rational if you think everything else can / will crash leaving only the US government solvent to repay its debts. Meanwhile, the junk-Treasury spread, depending on how you measure it, is now north of 700 basis points. If we assume that mid-rated junk has a loss rate of 4% per year and a maturity of 10 years, then its expected real return is the +1% TIPS yield at that point on the curve plus the 7% spread minus the 4% loss rate, or 4%. Compounding things even further, because of forced sales by hedge funds, the yields on municipal bonds are now several dozen basis points above that of Treasuries, something that occurs perhaps once in a generation, and usually at times of local government distress, which does not seem in the cards at the moment. Conclusion: The debt markets are so out of whack that we are now at a point where credit risk is being rewarded more than equity risk, something that should never happen in a world where equity investors own only the residual rights to earnings. 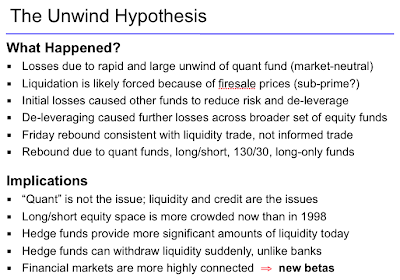 This cannot last for very long: either spreads will tighten rapidly, equity prices will fall rapidly, or both. (Or, chortle, earnings will grow more rapidly.) Stay tuned. Will China's Beijing Olympics performance match their dominance of international science competitions? A reader sends the following information. At 2008 the 40th Chemistry Olympiads held in Budapest, Hungary on July 21, 2008, all 4 Chinese students got gold medals, again China in 1st place. Last night's 170 lb title fight had some of the most beautiful judo throws I've ever seen in MMA. We call those "high amplitude" throws: when the legs of the guy getting thrown describe a big arc. Note to physicists: WEC = World Extreme Cagefighting, a sister promotion to the UFC, not Weak Energy Condition. The New Yorker has a great piece on the resurgent nationalism of young Chinese intellectuals. A couple of weeks later, I met Tang Jie at the gate of Fudan University, a top Chinese school, situated on a modern campus that radiates from a pair of thirty-story steel-and-glass towers that could pass for a corporate headquarters. He wore a crisp powder-blue oxford shirt, khakis, and black dress shoes. He had bright hazel eyes and rounded features—a baby face, everyone tells him—and a dusting of goatee and mustache on his chin and upper lip. He bounded over to welcome me as I stepped out of a cab, and he tried to pay my fare. Tang spends most of his time working on his dissertation, which is on Western philosophy. He specializes in phenomenology; specifically, in the concept of “intersubjectivity,” as theorized by Edmund Husserl, the German philosopher who influenced Sartre, among others. In addition to Chinese, Tang reads English and German easily, but he speaks them infrequently, so at times he swerves, apologetically, among languages. He is working on his Latin and Ancient Greek. He is so self-effacing and soft-spoken that his voice may drop to a whisper. He laughs sparingly, as if he were conserving energy. For fun, he listens to classical Chinese music, though he also enjoys screwball comedies by the Hong Kong star Stephen Chow. He is proudly unhip. The screen name CTGZ is an adaptation of two obscure terms from classical poetry: changting and gongzi, which together translate as “the noble son of the pavilion.” Unlike some élite Chinese students, Tang has never joined the Communist Party, for fear that it would impugn his objectivity as a scholar. Tang had invited some friends to join us for lunch, at Fat Brothers Sichuan Restaurant, and afterward we all climbed the stairs to his room. He lives alone in a sixth-floor walkup, a studio of less than seventy-five square feet, which could be mistaken for a library storage room occupied by a fastidious squatter. Books cover every surface, and great mounds list from the shelves above his desk. His collections encompass, more or less, the span of human thought: Plato leans against Lao-tzu, Wittgenstein, Bacon, Fustel de Coulanges, Heidegger, the Koran. When Tang wanted to widen his bed by a few inches, he laid plywood across the frame and propped up the edges with piles of books. Eventually, volumes overflowed the room, and they now stand outside his front door in a wall of cardboard boxes. Tang slumped into his desk chair. We talked for a while, and I asked if he had any idea that his video would be so popular. He smiled. “It appears I have expressed a common feeling, a shared view,” he said. Next to him sat Liu Chengguang, a cheerful, broad-faced Ph.D. student in political science who recently translated into Chinese a lecture on the subject of “Manliness” by the conservative Harvard professor Harvey Mansfield. Sprawled on the bed, wearing a gray sweatshirt, was Xiong Wenchi, who earned a Ph.D. in political science before taking a teaching job last year. And to Tang’s left sat Zeng Kewei, a lean and stylish banker, who picked up a master’s degree in Western philosophy before going into finance. Like Tang, each of his friends was in his twenties, was the first in his family to go to college, and had been drawn to the study of Western thought. Tang and his friends were so gracious, so thankful that I’d come to listen to them, that I began to wonder if China’s anger of last spring should be viewed as an aberration. They implored me not to make that mistake. When people began rioting in Lhasa in March, Tang followed the news closely. As usual, he was receiving his information from American and European news sites, in addition to China’s official media. Like others his age, he has no hesitation about tunnelling under the government firewall, a vast infrastructure of digital filters and human censors which blocks politically objectionable content from reaching computers in China. Younger Chinese friends of mine regard the firewall as they would an officious lifeguard at a swimming pool—an occasional, largely irrelevant, intrusion. To get around it, Tang detours through a proxy server—a digital way station overseas that connects a user with a blocked Web site. He watches television exclusively online, because he doesn’t have a TV in his room. Tang also receives foreign news clips from Chinese students abroad. (According to the Institute of International Education, the number of Chinese students in the United States—some sixty-seven thousand—has grown by nearly two-thirds in the past decade.) He’s baffled that foreigners might imagine that people of his generation are somehow unwise to the distortions of censorship. Also, see this Times profile of 110m hurdler Liu Xiang, and this discussion of the Chinese drive for medal dominance. Note, despite a population base of 1.3 billion, a Soviet-style sports system with a budget of billions of dollars, and an acute hunger for success, I predict that the Chinese will be surpassed by Jamaica (3M people with rudimentary training facilities) on the track. And this: Orville Schell, writing in the New York Review of Books, China: Humiliation & the Olympics. What will happen to the quants in August 2017?